So, let me tell you everything I know about shortbread. First and foremost, it’s a simple cookie with not very many ingredients. In order to get the best flavor, you have to use high-quality ingredients, especially when it comes to the butter – I used Kerrygold Irish Butter in this particular batch. Land ‘o’ Lakes is alright, but if you can splurge on some organic or Irish butter, then you will not regret it. It would be a mortal sin to try to use a butter substitute or even margarine, so just don’t go there. Second, shortbread is extremely versatile. 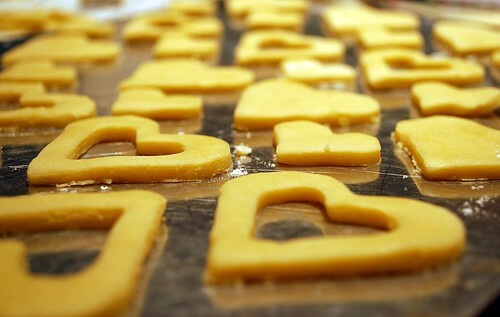 We love to make it at Christmas time with all of our favorite cookie cutters. Then we decorate them with festive colored sprinkles. But you can also flavor these cookies by adding any number of things: finely ground nuts, zest from oranges or lemons, chocolate chips, or instant coffee powder. 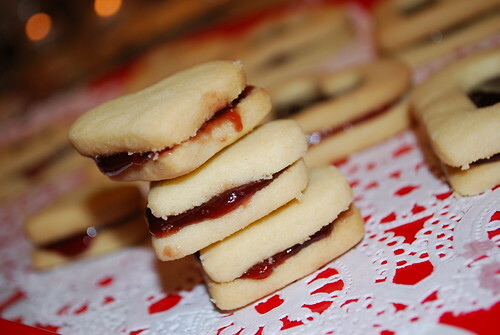 Here, I’ve made sandwich cookies with seedless red raspberry preserves, but you could use any sort of fruit filling you desire, or use a cream filling or your favorite icing. The possibilities are endless. Why do they call it short, you ask? Well, the answer is twofold. 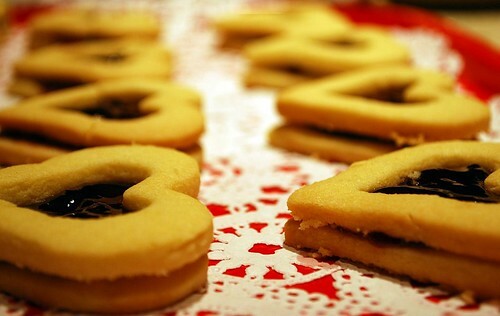 First, the “short” in shortbread refers to the “shortening” (or in this case, butter) that is used to produce a crumbly texture. Second, a crumbly texture is actually called a “short” texture. Think about it – shortcake has a crumbly texture, too! And the final, and most important, thing that I can tell you about shortbread is that it is the absolute BEST treat that you can have with your afternoon tea. One of my greatest joys in life is a cup of Earl Grey tea with a nice shortbread cookie to dip into it. Heaven! Preheat oven to 375 degrees. In a large electric mixer bowl, cream butter and sugar until light and fluffy. 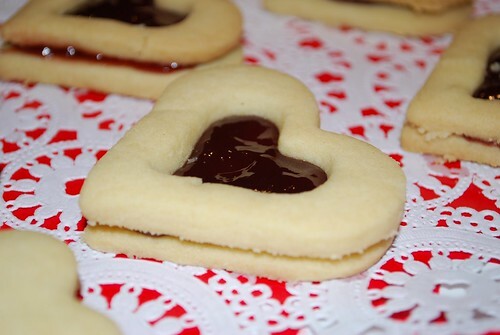 This step is particularly important since shortbread cookies have no leavening agent (i.e. no baking soda or baking powder), so the tiny air bubbles you’re beating in now are the only source of fluffiness in your cookies. Add the flour, and continue mixing until a stiff dough forms. If your mixture is too crumbly, add a tablespoon of butter, softened, until a nice pliable dough forms. On a lightly floured surface, roll out the dough to about a 1/4″ thickness. 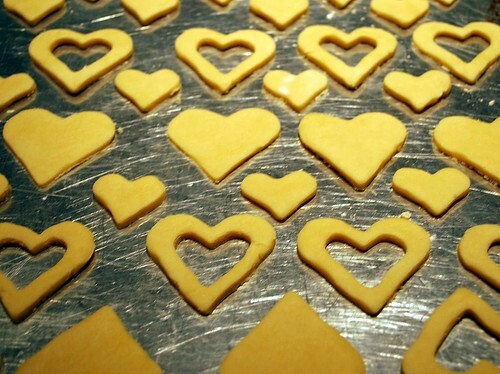 Cut the dough into desired shapes. 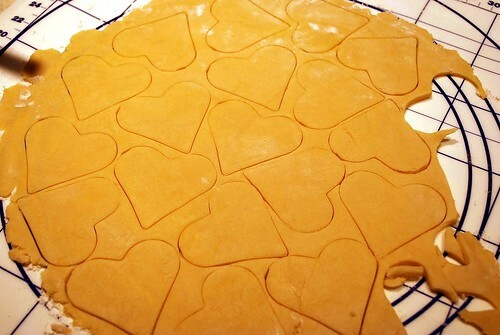 For these cookies, I cut all of the dough into hearts. Then I took half of those hearts and cut a smaller heart out of the center of each of them. That way, I had an equal number of solid-bottoms and window-tops to make my sandwiches! And I baked the smaller hearts, too, and made mini-sandwiches out of them. Place your cookies on ungreased baking sheets, about 1/2″ apart. Shortbread cookies don’t spread like some cookies do, so they hold their shape well and you don’t have to worry too much if they are close together on the cookie sheet! Bake for 15-20 minutes, or until cookies are “set” and starting to puff slightly. They do not need to be brown – just a very light golden color is good. Cool for 5 minutes on baking sheets, then remove to racks to cool completely. Once your cookies have completely cooled, it’s time to assemble them! 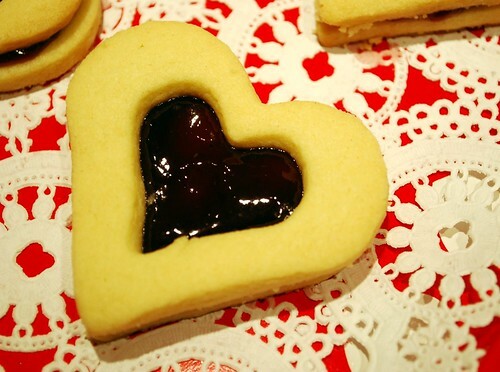 Place a large solid heart on a plate, spread about a tablespoon of your raspberry preserves around the center of the cookie. Gently place your window cookie on top and press down lightly. Voila! And here is a photo of a few of the mini-heart sandwiches I made as well. I love how the jam is dripping out the edges! Are you drooling yet?? ?